The Lucky Mojo Curio Co. is proud to announce a new book in our series on practical folklore. This Amazing Book - Hoodoo Herb and Root Medicine is restored, revised, and edited presentation of a little-known classic of medical herbology, first published in 1947 by the Sunrae Products Company of Ogema, Wisconsin. In this new edition, catherine yronwode teaches you the "other" side of magical rootwork — the down-home, historical, and practical medical side of the work. 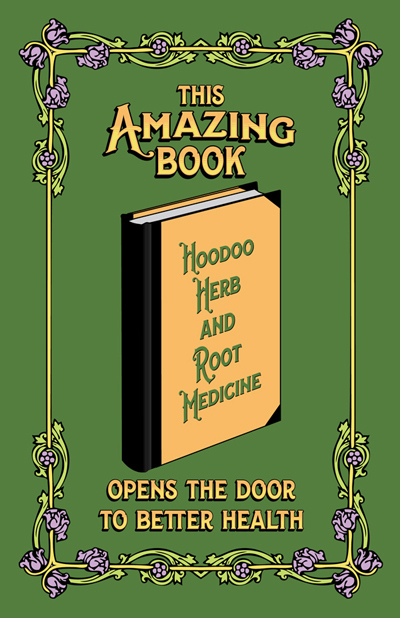 With new added illustrations, and pages of practical recipes for home-made medicines, this book is designed as a page-by-page cross-reference to the author's previous best-seller, Hoodoo Herb and Root Magic. Use these two books in tandem to get the best of two worlds from Nature's herbs, roots, barks, flowers, and seeds. I had the privilege of being one of the proofreaders of this book. And you know what? If you want to learn more about "This Amazing Book" check out the Lucky Mojo Hoodoo Rootwork Hour for April 23rd, 20117 -- i was a guest on my own show, with co-hosts ConjureMan Ali and Professor Charles Porterfield. I will also be a guest on the Candelo's Corner radio show with Candelo Kimbisa on Monday, April 24th, 2017, and on The Now You Know Show with Prof. Porterfield on Thursday, April 27th, 2017. Tune in and learn more about herbal medicine! Cat your amazing! I always enjoy your classes and your books,thank you for writing this book. "This Amazing Book" is now available via Amazon as well as through our shop.